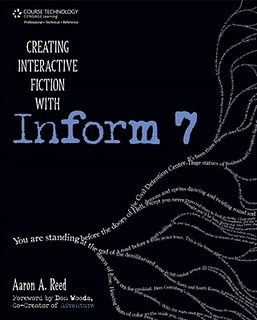 Creating Interactive Fiction with Inform 7 by Aaron A. Reed is a 448 page paperback (also available for the Kindle). It shows how to create a work of interactive fiction using the Inform 7 authoring system, explaining how the example game Sand-dancer was developed (with Alexei Othenin-Girard) from conception to final product. The first edition of the book was published by Course Technology PTR, August 18, 2010, and has a foreword by Don Woods. Creating Interactive Fiction with Inform 7: The Official Companion Site to the Book (RSS). Buy it from Powell's Books. Buy Amazon Kindle eBook version. Review by David Monath - in SPAG #60, April 25, 2011. This page was last modified on 26 April 2011, at 13:22.